2:1 Maltodextrin:Fructose: This drink’s ingredient matrix has been brought in line with some of the most recent research into energy drink formulation. Two published studies* in 2005 offered quite staggering results when Maltodextrin (a long-chain glucose polymer) was mixed with Fructose (fruit sugar) at a 2:1 ratio and since then, many more studies have demonstrated similar benefits*. Although Maltodextrin alone has been proven to be considerably more effective than Fructose in isolation, when the two are mixed in this 2:1 ratio, significantly more carbohydrate is made available for use. These studies have demonstrated that a 2:1 Maltodextin to Fructose mix caused athletes to absorb and use 40% more carbohydrate compared with consuming maltodextrin alone. What are the benefits? 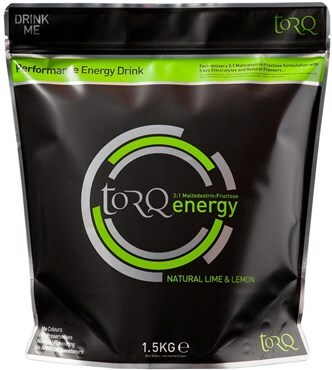 Quite simply, the increased availability of carbohydrate means that you will be able to sustain a higher pace for longer using TORQ energy, making this product the most advanced formulation available to endurance athletes on the market today. Electrolytes: TORQ energy contains Sodium, Chloride, Magnesium, Potassium and Calcium to replace the 5 electrolytes lost through perspiration. These salts maintain homeostasis within the body, allow it to hold onto water and preserve muscle function. Some brands do not include all of these electrolytes in their formulations, or run them at lower levels than they should some include none at all. No Artificial Sweeteners: For the same reasons as highlighted above, we don't believe in the use of artificial sweeteners like Aspatame, Acsulfame-K, Saccharine and Sucralose. These artificial sweeteners are 100's of times sweeter than sugar and Aspartame/Acsulfame-K are particularly controversial with regard to long-term health.